But seriously, I have been very busy this week in my "other job" as a musician- 4 concerts, a parade, a wedding, two rehearsals and two lessons taught. It's one of those rare weeks where I feel like I'm almost making it financially as a professional musician. I just wish every week could be like this one! When I was in high school & college I wanted to play in symphony orchestras. I fully envisioned myself in a big city orchestra by this time in my career. Well, that didn't happen. What did happen is that I started teaching lessons and picked up freelance jobs here and there. I also play in a semi-professional concert band- which I enjoy more than when I was playing in orchestras. 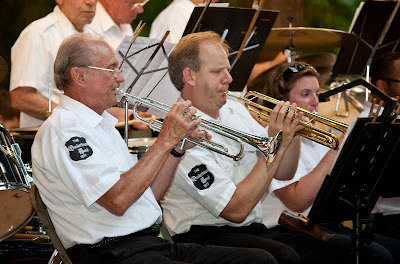 That's me on the right, with my fellow trumpet section-mates Maynard and Pete playing a concert on 7/6. So life brings change and I'm OK with where I am right now- just wish I had realized it would be like this back when I was 17. I would have gotten a Music Education degree (instead of a performance degree) and been a band teacher probably. But what about the outfit? 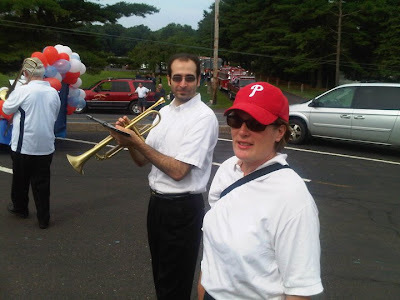 With the Galena Brass on the 4th. My go-to outfit all this week has been some variation of the standard musician's "uniform" of white shirt and black pants. I have always been fairly image-conscious when I play- I almost never wear vintage and rarely wear skirts or dresses to play. My goal was always to be known as a good player, and not "that girl trumpet player", or "that vintage girl trumpet player". So I guess I tend to play it safe. What about you? In your professional life do you wear much vintage? That is so cool! It's good that you've kept up with something you really love. This would be the week for musicians! All the parades and celebrations! Very cool that you can actually play! A Big Announcement and a Sale! Flea Market Friday: Yard Sale Scores!